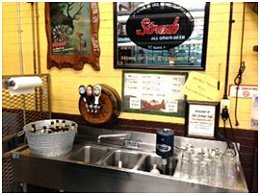 Straub Brewery Inc. on 303 Sorg Street in St. Marys, Pennsylvania has been brewing continuously since 1872 utilizing fresh Allegheny mountain water. All ingredients are carefully chosen to create the finest beer made anywhere – Straub American Lager, Straub American Light Lager and Straub American Amber as well as a variety of Specialty and Seasonal beers. 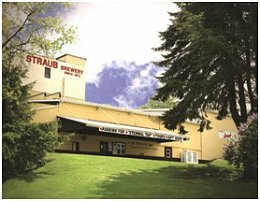 Take an up-close and personal tour of the facility; learn about the history of Straub and their brewing process. Afterwards guests can sample some of the crisp and refreshing quality brews from the world famous Eternal Tap™. Taste the unique American Lagers, as fresh and natural as the great outdoors and true to their tradition. Then visit the Gift Shop where Straub has a wide selection of collectibles, apparel and specialty items. While the world has changed in the last 140 years, the proud artisan skill of the Straub Craftsman never will. Today the Straub family continues the passionate traditions of the American Legacy Brewery™. Tuesday to and Wednesday at 10:30 am, Thursday and Friday at 10:30 am and 12:30 pm. Saturday tours are available by appointment only. We ask at least a 3 day notice before scheduling a Saturday Tour which will be given between 9 am and 10 am. Saturday Tours are scheduled by a first come first serve basis. NOTE: Straub Brewery is not in production on Saturdays. Book a tour on-line.